By observing multiple collisions between huge clusters of galaxies, scientists have witnessed dark matter coasting straight through the turmoil. Dark matter is the mysterious, invisible stuff that makes up 85% of the matter in the cosmos - and these results rule out several theoretical models put forward to explain it. This is because it barely interacts with anything at all, including the dark matter in the oncoming galaxies. The work appears in Science magazine. To conduct their study, astrophysicists looked at 72 smash-ups between galactic clusters, using two space telescopes: visible light was recorded by the Hubble Space Telescope, and X-rays by the Chandra Observatory. Scouring multiple views of the collisions, the researchers tracked the movement of the three main components of galaxies: stars, clouds of gas, and dark matter. The violently swirling clouds of gas are hot enough to glow with X-rays, which Chandra detects. And stars can be seen in regular, visible-light images from Hubble. Dark matter is more difficult to "see" - but not impossible. Although it does not emit or absorb light, it does have gravity, and so it bends the path of light passing nearby. This warps our view of anything on the other side of it, in an effect called "gravitational lensing". "Looking through dark matter is like looking through a bathroom window," said Dr Richard Massey from Durham University, one of the study's authors. "All the objects that you can see in the distance appear slightly distorted and warped." Using this distortion allowed Dr Massey, with colleagues from the University of Edinburgh, University College London and Switzerland's Ecole Polytechnique Federale de Lausanne (EPFL), to "map" the dark matter in the clusters as they collided. Galaxy clusters are vast and contain huge amounts of dark matter, so when they collide - over billions of years - it offers a unique glimpse of how the stuff behaves. "We like these collisions because it's exactly what we'd do in the lab," Dr Massey told BBC News. "If you want to figure out what something is made out of, you knock it, or you throw it across the room and see where the bits go." "It seems not to interact with anything at all," Dr Massey said. Our new measurements of the self-interaction of dark matter are some of the best yet. But statistically speaking, the strongest result from this study is in fact the confirmation that dark matter really does exist in these galaxy clusters. We measured three things: the position of stars, the position of mass, and the position of gas. If there was no dark matter, then all of the mass that isn't accounted for by the stars would be associated with the gas. But we found an offset, which confirms that there is something in the clusters that is not gas, has mass, but that we cannot see: a dark matter. This detection is statistically very significant - corresponding to a probability of better than 99.99999999999% that dark matter exists in these clusters. Sometimes I think dark matter is a terrible name. It was originally coined because the phenomenon does not emit or absorb light. But light is everywhere in the dark matter we have observed, passing within it and around it. Indeed, the lensing effect that we employed in our study uses the light from distant galaxies that has passed through dark matter. So perhaps "transparent matter" or "clear matter" are better names. My favourite alternative is "materia incognita" (the unknown material). Maps used to be labelled "terra incognita" in areas that were unknown, and in a similar way we could be explicit about the unknown nature of this phenomenon. However, thanks to studies like this one - and much more work planned for the coming years - our ignorance will one day end. Then we can finally give this "something" a proper name. Earlier observations of the "Bullet Cluster" - a bust-up between two particularly big groups of galaxies, now in its final stages - had already demonstrated dark matter's weird lack of interactions, including with itself. But this new, major survey was able to deliver much more precision, concluding that there was even less interaction than the previous work allowed for. "If you bang your head against the wall, the electrostatic force between the molecules in your head and the ones in the wall cause a collision. 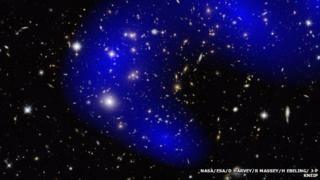 This is what dark matter doesn't seem to feel," Dr Massey explained. Dark matter does "feel" gravity; those interactions are the reason we know it is there, and the reason it is bound up in the galactic collisions to begin with. But the lack of almost any other interaction makes it even more mysterious than before. "In all of these collisions that we've seen, it just seems to go straight through. And now we've seen loads more of them, we would have been able to detect any deceleration of this dark matter, if it had interacted in the ways that most theories predict," Dr Massey said. So although some theories remain, many can now be ruled out. This includes the idea that dark matter is some sort of "dark" version of ordinary matter, made of "dark atoms". It must be more outlandish than that, Dr Massey said. "Basically, we're saying: Back to the drawing board! Let's come up with some more ideas."